5.1.3 What is "JWT and STP-IM"
How are STP and JWT best put to use together ? This joint STP - JWT discussion aims to answer this question by identifying use cases, putting STP and JWT face to face and outlining their respective vision, offering and features, weight their oppositions and complementarities, in an attempt to foster a common, consistent, integrated vision and tooling of BPM and SOA. 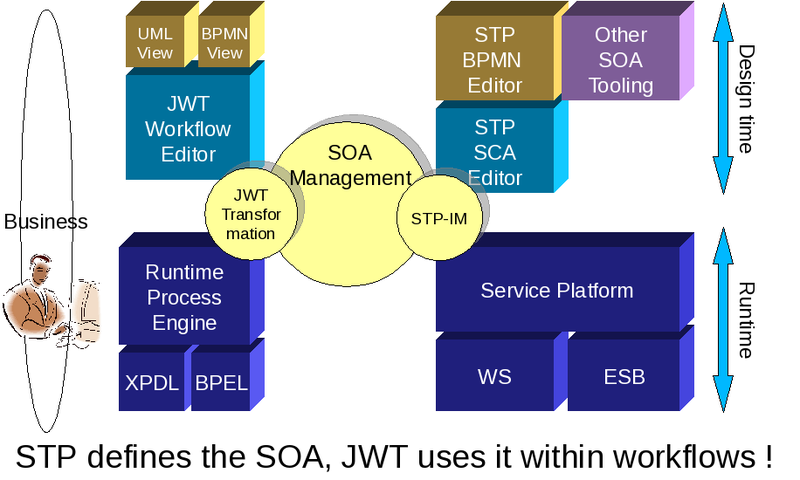 Note that a key technology is the STP Intermediate Metamodel, which offers to be the "glue" in the SOA space between the various STP tools, and that has already been integrated in JWT for a given use. See older and more theory-grounded, STP-IM focused discussion at STP/IM Component/Discussion on STP IM and JWT. This vision stems of the use case analysis below and has been presented at Eclipse Summit Europe 2008 (thanks STP head Oisin Hurley for lending the last minutes of his session talk). In short, STP designs and manages the Service Oriented Architecture and its infrastructure, JWT designs and manages business-driven workflows that are built like good SOA citizens. or "STP designs the SOA, JWT designs business workflows on top of it". Based on synchronizing service definitions between STP and JWT. STP first designs the SOA. Here can be used WSDL designers, SCA editors, policy editors, service packaging tools... The SOA can then be deployed on the chosen service platform(s). the whole set of this SOA's services are gathered and managed in a single STP-IM model. From now on, this model's service definitions become pivotal and the single touchpoint between STP and JWT. In JWT, we then import this SOA's services in a workflow model as service calling applications (typically using an "Import SOA > STP-IM" action implemented by a JWT transformation). We can now design workflows sitting on top of this SOA, and deploy & execute them using the chosen JWT runtime. Further in the SOA lifecycle, new services & new workflows can be alternately be designed, with the SOA's single STP-IM model being used at each step to again transport service definition information and reconcile service and process space. The previous use cases rely on STP-IM-managed service definitions. In order to make it as painless as possible the first step of getting its existing service definitions in STP-IM, users should be able to import service definitions from the simplest kind of service definitions (a set of WSDL files, of SCA files, of URLs, or even of Java interfaces...). That can be thought of as migration or wizards stuff and would be useful to both STP and JWT tools, and vice versa : Export SOA as well. Question to STP : does it exist already ? Further, the need appears to centralize / unify the use of STP-IM across tools. This culminates in the idea of an STP-IM builder. But before even getting there, it would be nice not to have to select in each tool which STP-IM model is in use to synchronize the tools in use. That could be done by configuring one (or more ?) STP-IM model(s) in use in a common STP-IM Preferences pages. Interoperability between JWT & STP process runtimes (typically by using JWT transformations & STP-IM to synchronize process definitions). This would allow ex. to 1. design a service orchestration process using STP BPMN and make it executable on its runtime and 2. design business-driven workflows in JWT that at some point calls 1. BPM as full fledged SOA citizen, i.e. process engines are themselves used and managed through SOA-managed services across STP and JWT. JWT - STP-IM transformation by Augsburg University. TODO describe what it does. JWT's SOA vision : JWT intends to address classic BPM lifecycle problems using SOA benefits. The upcoming JWT 0.7 "SOA" release will allow JWT workflows to call services using a unified design & API, and a Nova Bonita-based runtime will be made available. or as the open, flexible BPM modeler for STP. STP-IM allows the integrated tools to share information in the SOA space. However much other information remains in each tool. Therefore STP-IM allows tools that are complementary within the SOA space to work together (ex. a BPMN modeler and a web service deployer), but it is much harder for tools that do the same job or overlap (ex. two JBI service tools). JWT wants integrated tools to open up their information, in order to foster emerging consensus on subspaces metadata. It does so by promoting metadata that is consistent across all formats / languages / models, through consistent "rules of the good citizen" in WE metamodel, transformations and WAM APIs. What is "JWT and STP-IM"
Goals : to build the vision of what is "JWT and STP-IM"
and in practice (consistency of complete tooling solution : where does jwt2stp-im fit in the soa development process...). only in the business / design space ? vertically in the BPM "column" part of it ? how does it concretely map to already STP-IM-integrated STP tools ? Top-down-approach: where most workflow engine vendors have a bottom-up approach and often create a modeling tool that is only compatible with their own workflow engine, we work top-down in order to be adaptable with several workflow engines. We do not only consider design time, but also runtime and are working on integrating both. It will definitely be interesting to see how JWT and STP can collaborate, and I think probably a good next step would be to think about some scenarios which would show how end-users could use JWT and STP in an "ideal" world, where all tools/editors can communicate :) This would give some concrete fuel to the discussion on what to develop next (and the existing transformation from JWT to STP-IM is definitely a great start). A lot of things have been said. Quoting STP head Oisin Hurley's notes, "these guys can help us, we can help them". Answering "why and how better integrate together" starts by looking at use cases. Marc introduced the use case "STP designs the SOA, JWT designs business workflows on top of it", which bore the "STP for SOA, JWT for workflows" vision and diagram presented the next day at the end of Oisin's session talk. Advanced topics been adressed include streamlining the use of STP-IM through a model reconciliation / synchronization technology-based Eclipse builder. This page was last modified 05:30, 11 December 2008 by Marc Dutoo. Based on work by Florian Lautenbacher.